Kate’s Dogsafe® Canine First Aid 101 certificate. Obtained on March 31, 2019 and valid through March 31, 2022. 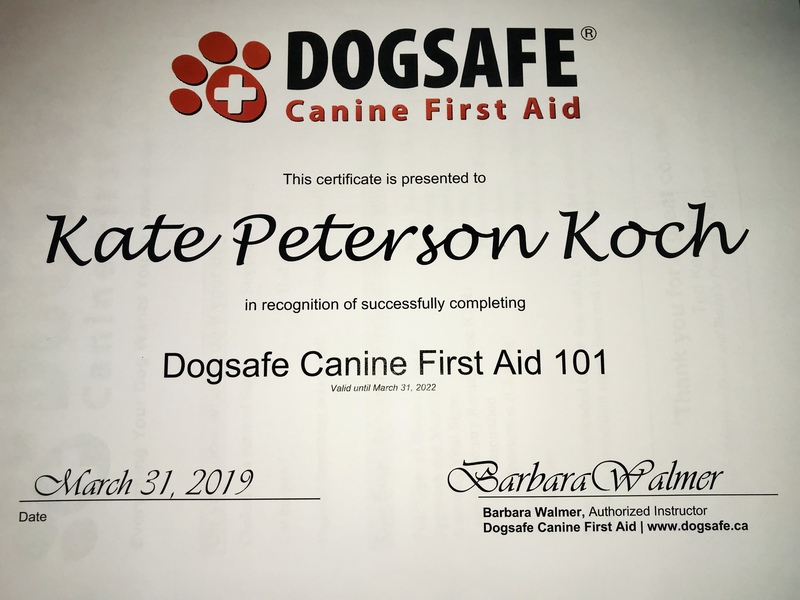 Yesterday, Kate and apprentice Anna had the pleasure of taking the Dogsafe® Canine First Aid 101 course, presented by highly regarded dog trainer and educator Barbara Walmer CPDT-KSA, CBCC-KA, KPA CTP, ACDBC. Barbara is a fellow trainer at Kayenna Kennels – if you ever get a chance to take a course from her, do it! Her knowledge is unsurpassed. From 9 am to 5 pm, we learned about canine CPR, emergency first aid, and scene management (amongst other things). It was a fun and informative session, and Dr. Jenny Richards of Sundance Animal Hospital opened up the clean, cozy, and welcoming clinic to us. If you’re looking for a clinic in Calgary, this is a great one to consider. Keeping our skills fresh and updated is an important part of providing the best services we can to our clients. Whether it’s dog training webinars or seminars, low stress handling, or things like pet (and human) first aid, the more tools we have in our tool chests, the deeper the understanding of our clients and their needs. It was fantastic to have Anna join and add first aid to her growing repertoire of skills! Previous DOG PACKS: they aren’t a thing.